The Alpine hill features a 250-foot vertical drop and 9 alpine trails serviced by two lifts - a quad chair, and our newest addition, a Magic Carpet Lift. The longest run is approximately 2,400 feet and the lift capacity is approximately 4,800 per hour. Brookvale Provincial Ski Park has introduced a mandatory helmet policy for all users of the downhill facility. Brookvale has invested in additional rental helmets to ensure guests who do not own a helmet will be able to enjoy the slopes. It is important to note that helmets do not guarantee someone's safety in a crash, but they do provide additional protection and help reduce the likelihood of serious brain injury. Skiers and snowboarders are required to educate themselves on the benefits and limitations of helmet use. 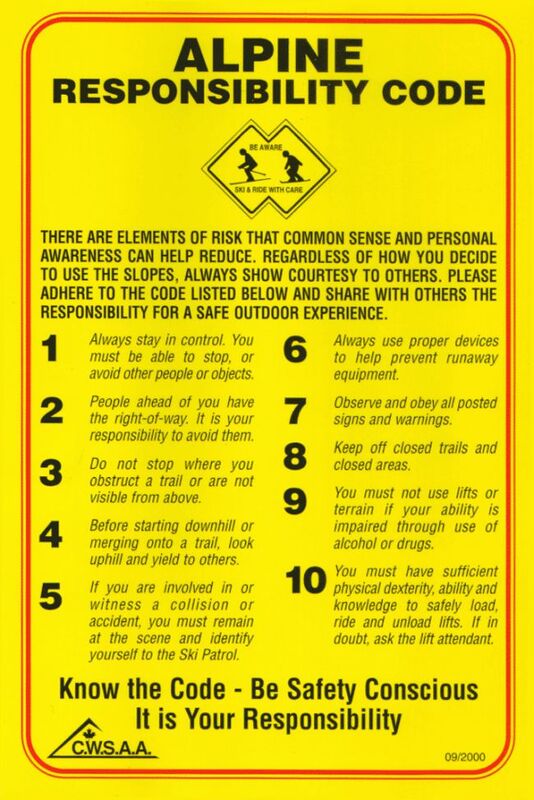 The primary safety consideration and obligation under the Alpine Responsibility Code is to ski and ride in a controlled and responsible manner. For information about how to choose and properly fit a ski helmet visit https://www.skicanada.org/safety/how-to-choose-a-helmet. Rules made by ASSQ are in force in present area. These rules apply to all Apline skiers and anyone practicing a sport indended to be practiced on an Alpine ski slope. View Alpine Responsibility Code. Ski under the influence of alcohol, drugs, narcotics or any substances impairing your faculties. If found to be under the influence, you must immediately remit your ticket to any representative of the area operator upon simple request. Enjoy skiing and please be careful!